What a fun way to meet people, keep fit and above all exercise that mind! Starting with the first few calls that you learn at a Barn Dance, a repertoire of moves quickly builds up to keep your eight moving at brisk walking speed. There’s no hopping or skipping in square dancing, as there is in Scottish Dancing. Nor do you learn long sequences of moves as in Sequence Dancing. You just build up a collection of short moves as the caller directs the square, in a different sequence every time to keep it fresh and interesting. Once you have learnt the moves up to a particular level, for instance ‘Mainstream’, you can dance at this level anywhere in the world; it is always ‘called’ in English, even in Sweden, Germany or Japan, where it is gaining in popularity. A ‘tip’ as it is called, has two parts, a ‘hash tip’ where the caller creates a sequence of moves against a musical background to provide the rhythm, and a ‘singing call’ where the moves are interleaved with the words of a song and the ladies work around the square dancing with each man in turn. Our caller has a good voice. Good for couples or singles, these days people tend to dance in ordinary clothes, but for a special evening the ladies may wear a full skirt and men may wear a Western. 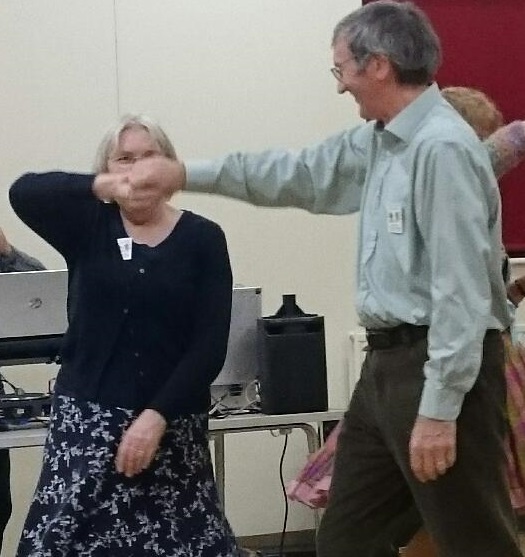 In Bicester, we dance at Langford Village Hall on Tuesday evenings, 8-10pm.